The 2014 Nissan Altima has an app for the people who just can't disconnect, even when driving. Settings available through the car's touchscreen display let you respond automatically to your eager followers while you're driving the car. We all know that teens (and many adults who should know better) are texting too much in their cars. In some states, like California, it's illegal. (This chart will help you wade through the legalities.) In the 2014 Nissan Altima, when you're parked (of course), you can use the touchscreen to type in a custom reply message, such as, "I'm driving, can't respond," to each person who sends you a text. Once set, it happens automatically while you're driving. With Facebook, there's an equally slick status-update feature. You can set a custom message like "Heading to school" or "With friends in my Nissan." For status updates, you have to use the USB connection (sorry, no Bluetooth) and run the NissanConnect app on your iPhone or Android device. But here's the catch: you have to wade through a few menus to get to the status updates. You press the Apps button on the dash, then the Facebook button, then the status button, then select the status. In theory, you can use voice commands, but when we tried it, the car kept saying our iPhone was not supported. Also, poor cellular data connections appeared to stop the feature in its tracks. These glitches are worrisome, as they could distract the driver. 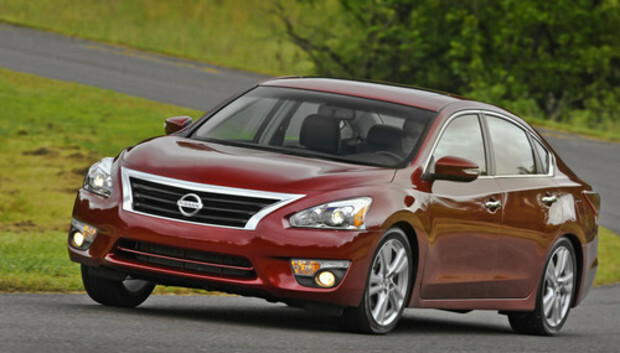 The 2014 Nissan Altima has some other nice online features. The car lets iPhone users find locations via Google Search, and Android users can stream via Pandora. Nissan is trying to save social-media addicts from their most dangerous habits (while driving), and that's an honorable endeavor. While the texting feature is simple, the Facebook implementation is more complex and could end up being its own distraction.